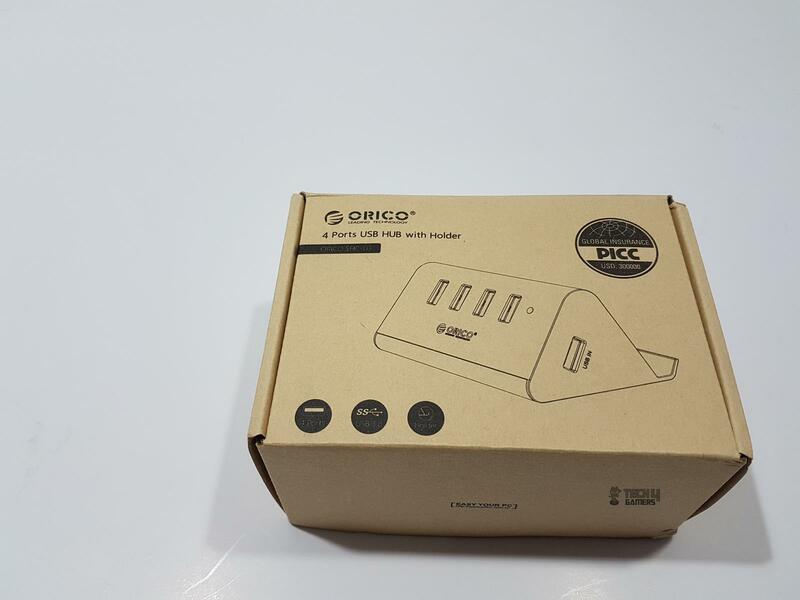 ORICO Technologies Co., Ltd. is one of the global leading manufacturers of computer peripherals and digital accessories, whose brand ORICO is based on the innovative concept of “Easy Your PC” who has completed its nine years of in development. 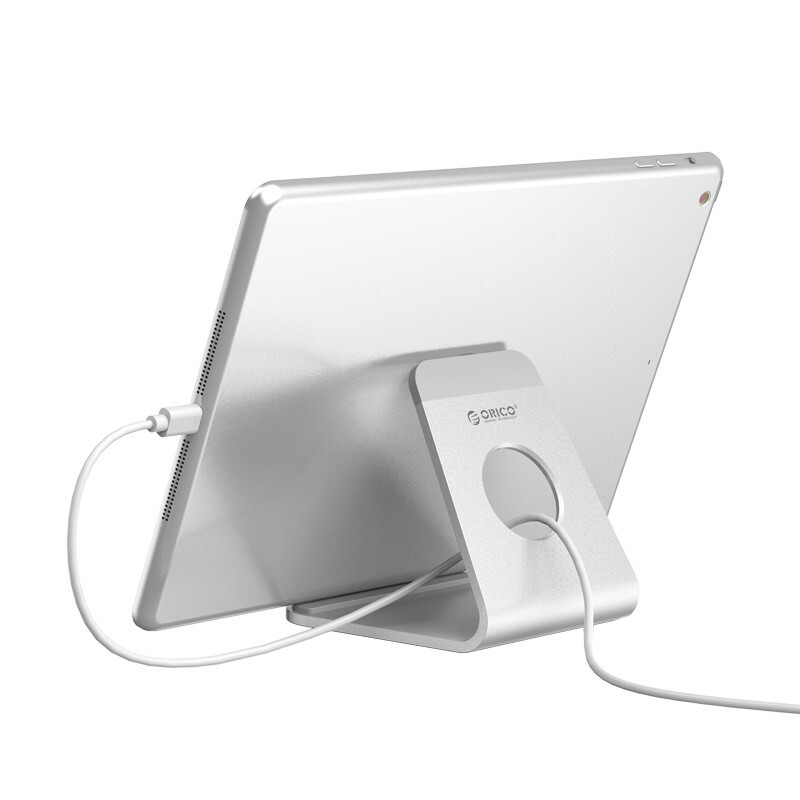 Devoted to excellent electronic products and accessories, ORICO owns the most comprehensive computer peripherals and digital accessories involving Storages, Hubs, Chargers, Surge Protectors, Batteries and other accessories. 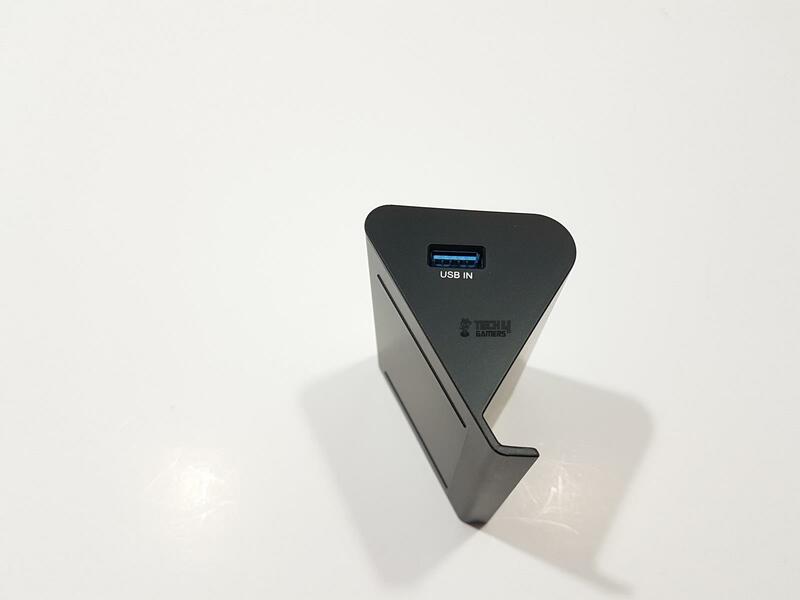 They term themselves a leader of external storage, USB 3.0/3.1 and mobile phone USB intelligent fast–charging technology. 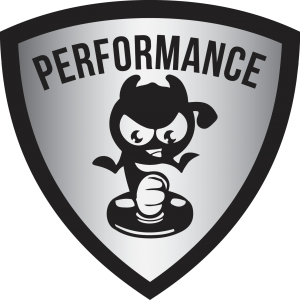 Orico maintains the strategic cooperation with premium brands like Western Digital, VIS, NS, Norelsys, Realtake to name a few. 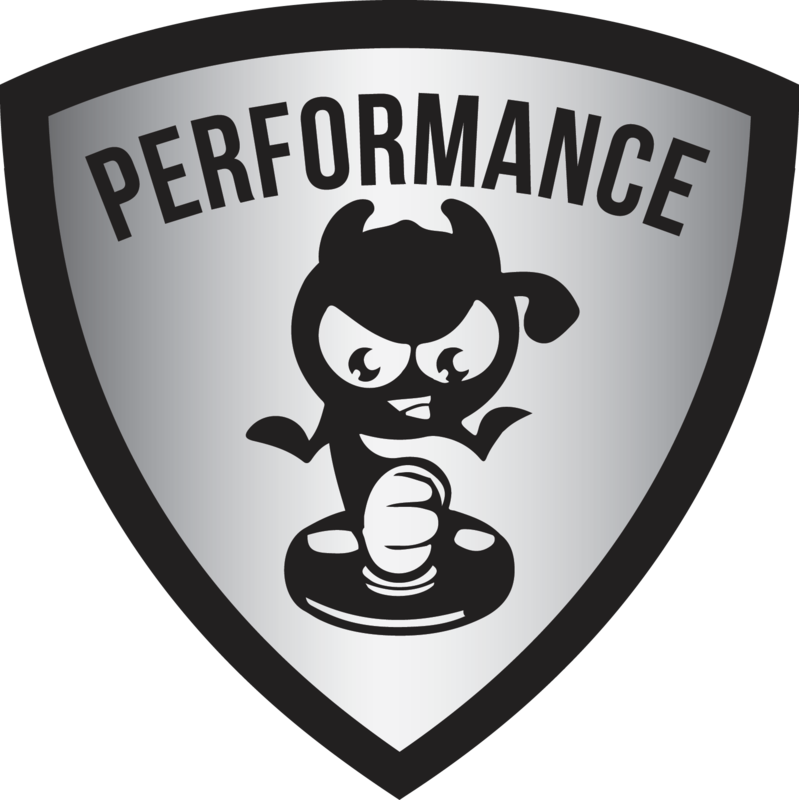 Much of this specialty is coming from their own specialized product development and production industry chain. ORICO is not so much a brand as an inventive philosophy. ORICO de-emphasizes so-called fashion but becomes the trend of markets all the time, which concentrates on every single detail of product so as to bring you great experience by using ORICO product more easily and cozily. 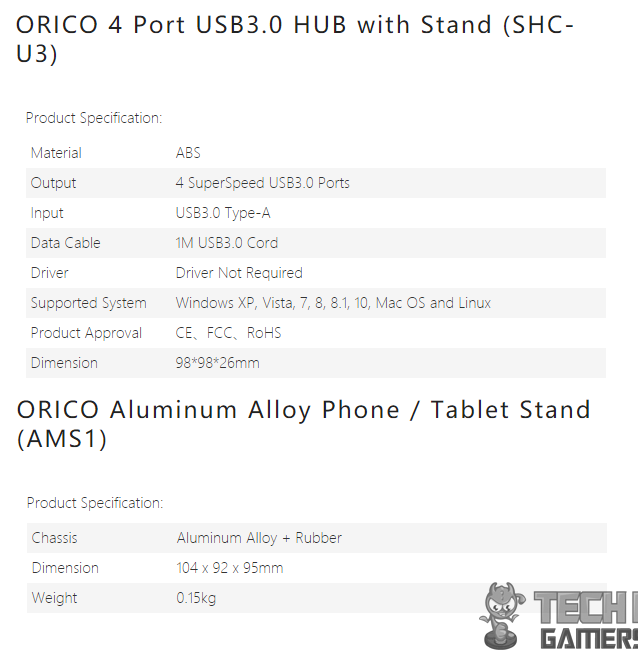 ORICO has sent us their Aluminum Alloy stand AMS1 and 4 Port USB 3.0 hub with stand SHC-U3 for the review. I will be covering both products in this content. The AMS1 is a beautifully crafted stand for the phones and tablets. It has 60° inclination to place the device on the stand in that viewing angle and has silicon mats on the top and at the tip of the base. This is a CNC machined stand finished to mimic the Mac styling. 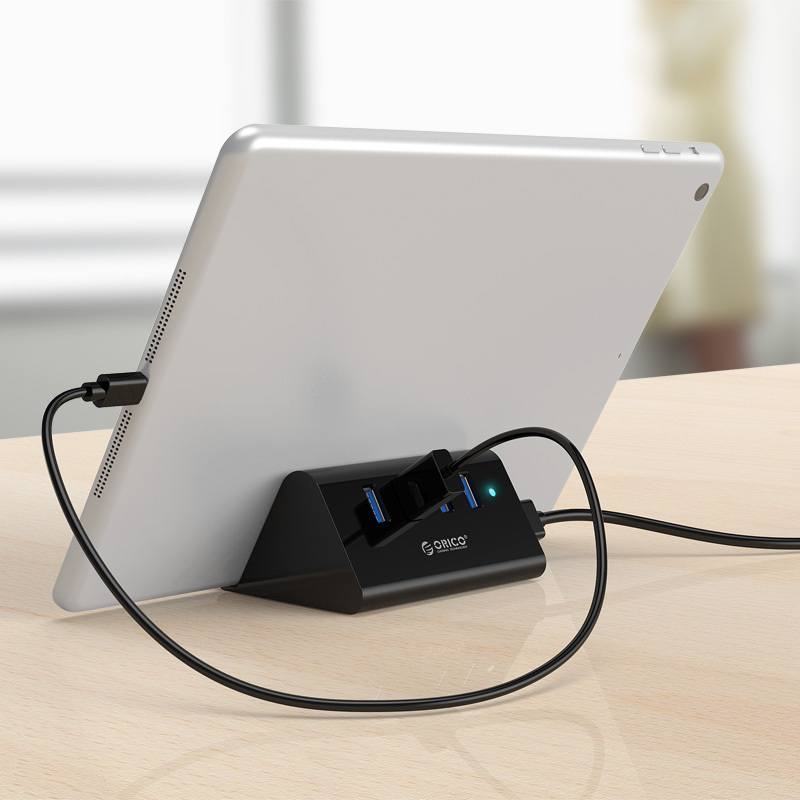 The SHC-U3 is a 4-ports USB 3.0 hub with a stand at its back. 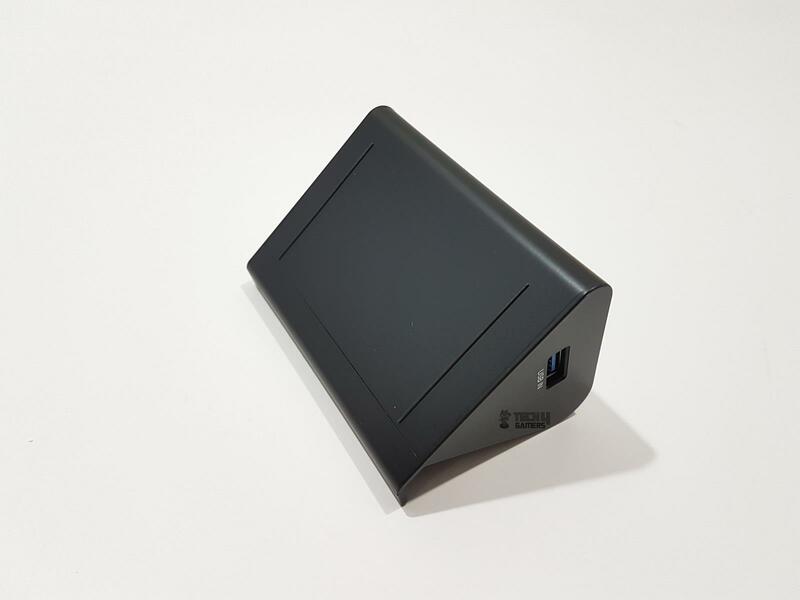 It has USB 3.0 Type-A interface and is quite convenient yet stylish way to connect multiple devices with the laptop/desktop PC. It is compatible across the multiple platforms like Microsoft Windows, Linux, Mac and comes in two colors; white and black. 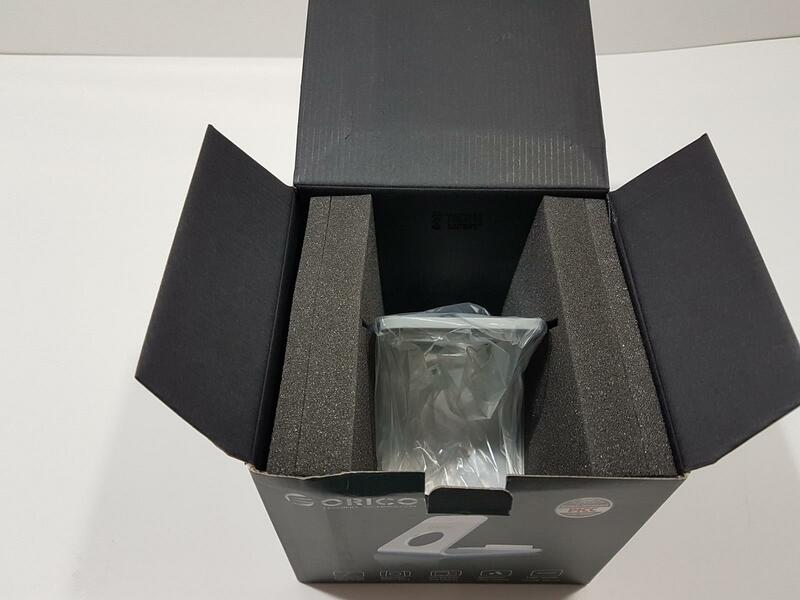 The product is shipped in a cardboard box in the black color background. The front side of the box has ORIC brand name and logo printed on the top left. There is a picture of the stand in the center. Salient features of the stand are highlighted at the bottom. 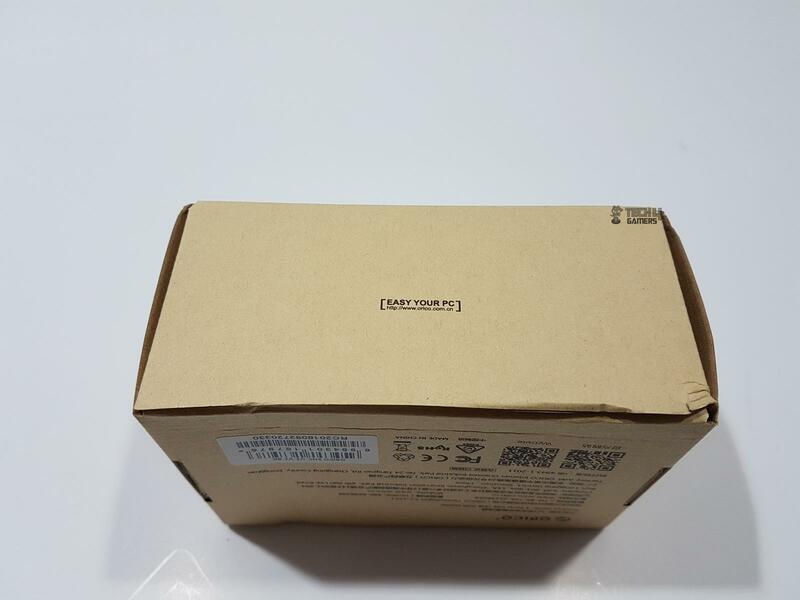 The right side of the box has specifications of the stand printed in the Chinese language on the top. Company’s contact information is printed below the specifications. 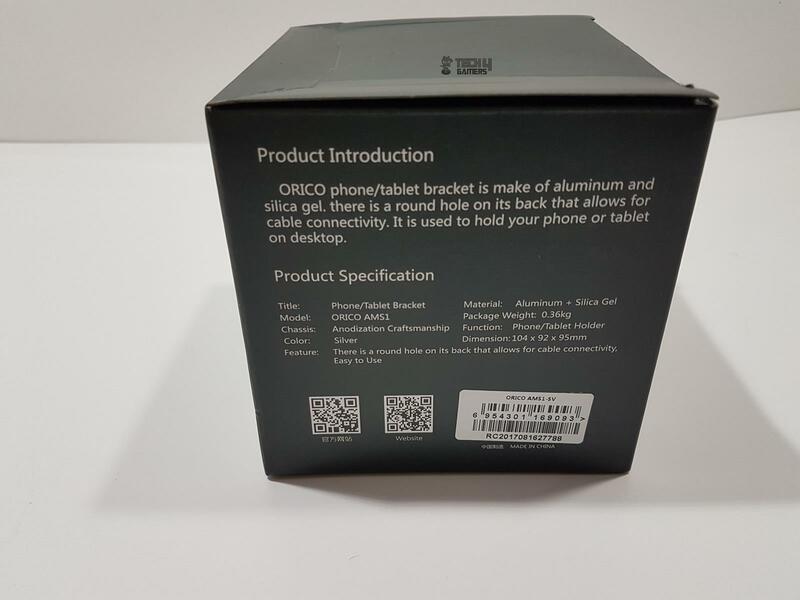 The left side of the box has product introduction and specifications printed in the English language. A serial no sticker is pasted at the bottom right side. The product is made in China. Opening the box will show the stand nicely tucked inside the black color Styrofoam pad. 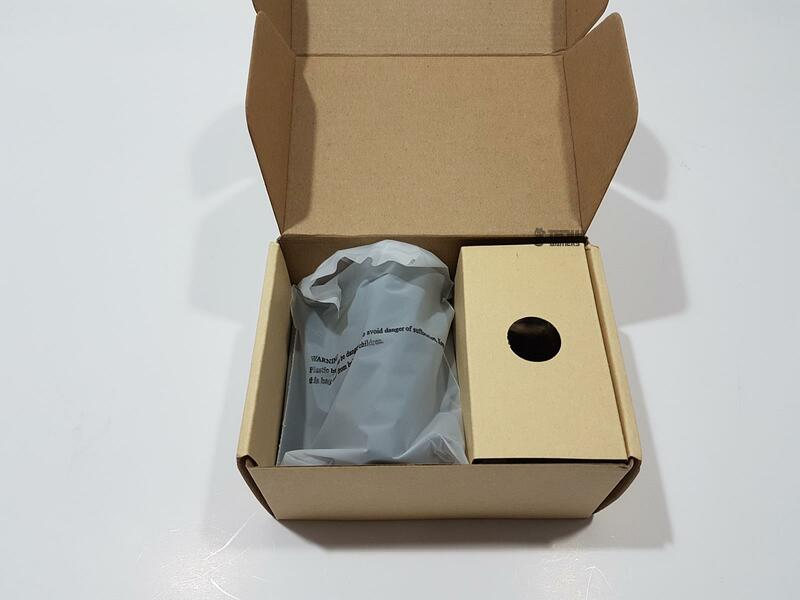 The product is shipped inside a brown color rugged cardboard box with retail information printed on the box itself. 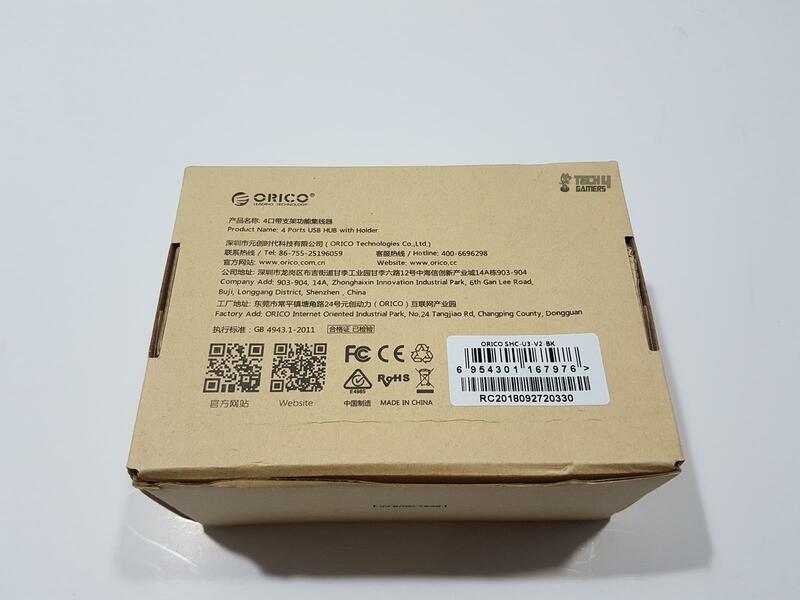 The top side of the box has ORICO brand name and logo printed on the top left. There is a diagram of the product in the center. 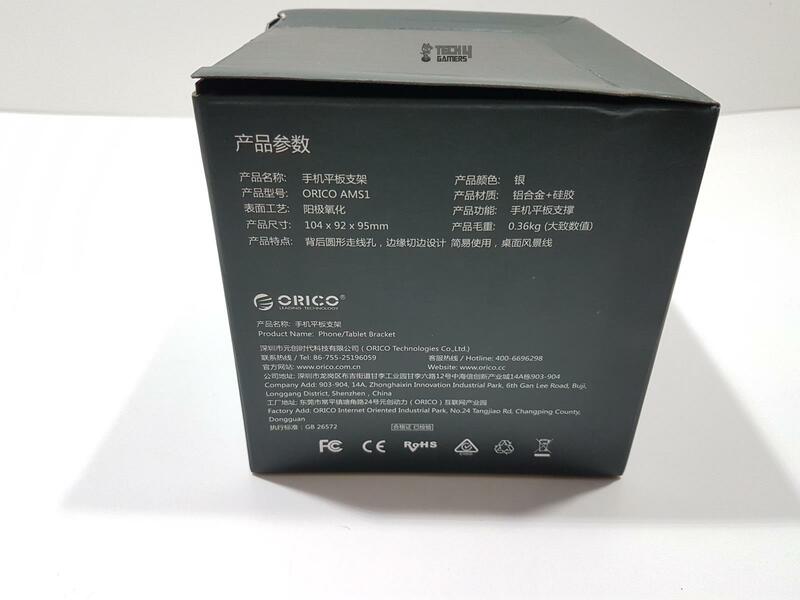 The bottom side of the box has ORICO brand name and logo printed on the top left followed by the product name. A serial no sticker is pasted at the bottom right side. Company’s contact information is also printed here. The opening cover side has ORICO slogan printed saying Easy your PC. Opening the box will show the hub placed inside the plastic cover on the left side. The accessories are placed on the right side of the box. Let’s start with the Aluminum Alloy Stand (ASM1). 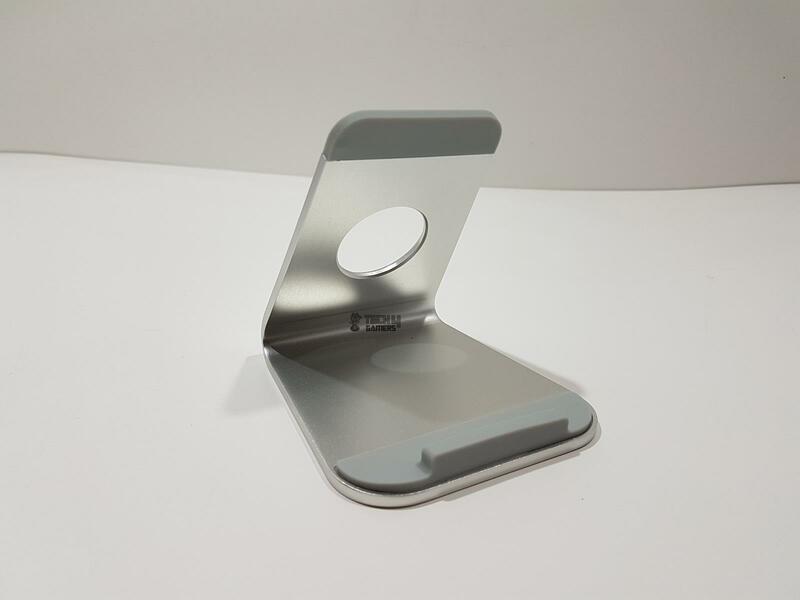 The stand is made of Aluminum Alloy and silicon mat of gray color. It is CNC machined to achieve the near-perfect precision and accuracy with the top-notch finishing to mimic the Mac style. The silver shines! The dimension of the stand is 104x92x95mm. The weight of the stand is 0.15 KG. The backside of the stand has a large size circular hole in the middle for cable passing. The top side has gray color silicon rubber placed on the tip, creating one heck of a beautiful outlook. 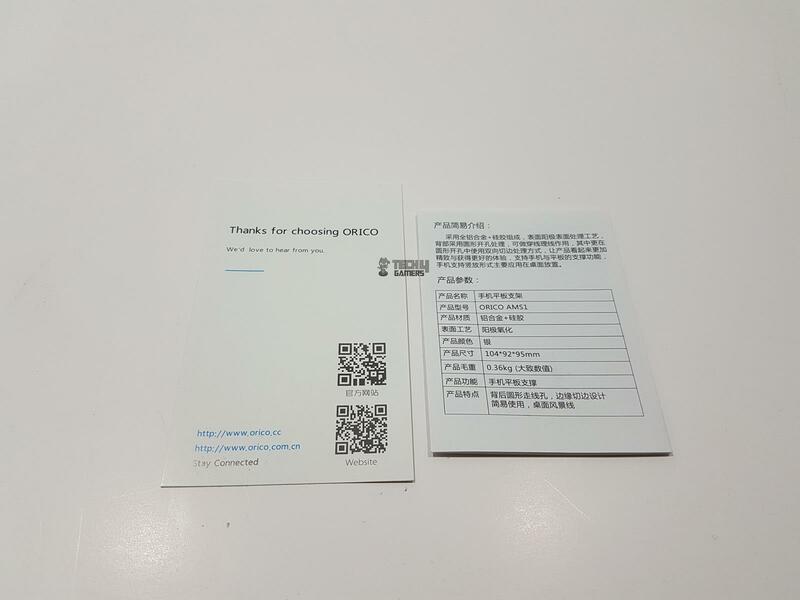 There is ORICO brand name and logo printed below the silicon rubber. The bottom part has an angular design. The complete block is made of a single aluminum piece and finishing has my utmost praise. The front side shows the angular design with the base of the stand having silicon rubber pasted on its tip. This silicone mat has a raised surface which is a smart move as it catches the base of the devices to fit them securely. This design also helps in reducing the slipping of the devices and ensures a firm grip. The other side of the stand has pure aluminum speaking for itself without any branding or anything. This stand is designed for the phones and the tablets to help the users with ease of use operation with 60° viewing angle. The comfortable handle is a result of the Anodic oxidation process. 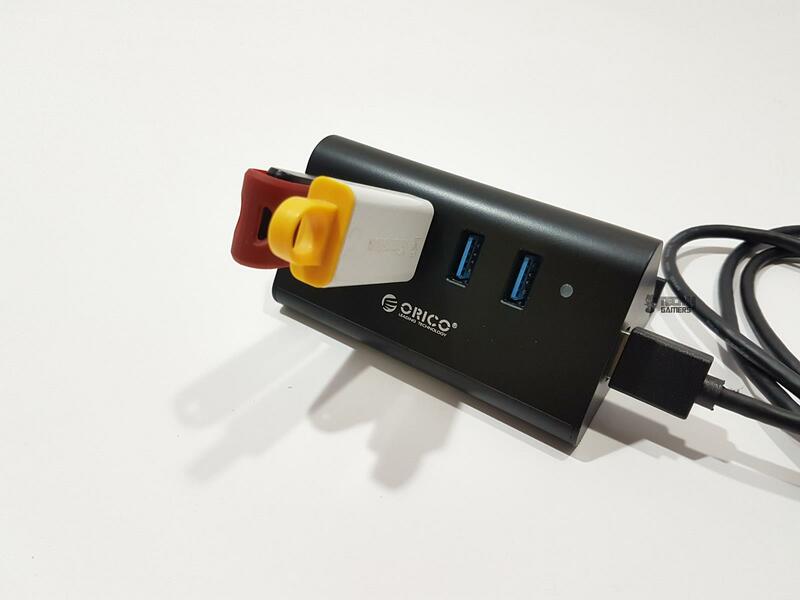 The 4-Port USB 3.0 hub and holder is a convenient way to connect up to 4 devices with the PC/Laptop in addition to placing your mobile device on the dedicated stand. This USB hub comes in two colors, white and black. The dimension of the hub is 98x98x26mm. It has four USB 3.0 ports on the front side whereas the Input USB port is on the right side. The hub is made of the ABS material. There is no driver needed to operate this hub and it supports Microsoft Windows XP/Vista/7/8/8.1/10, Mac OS, and Linux operating systems. 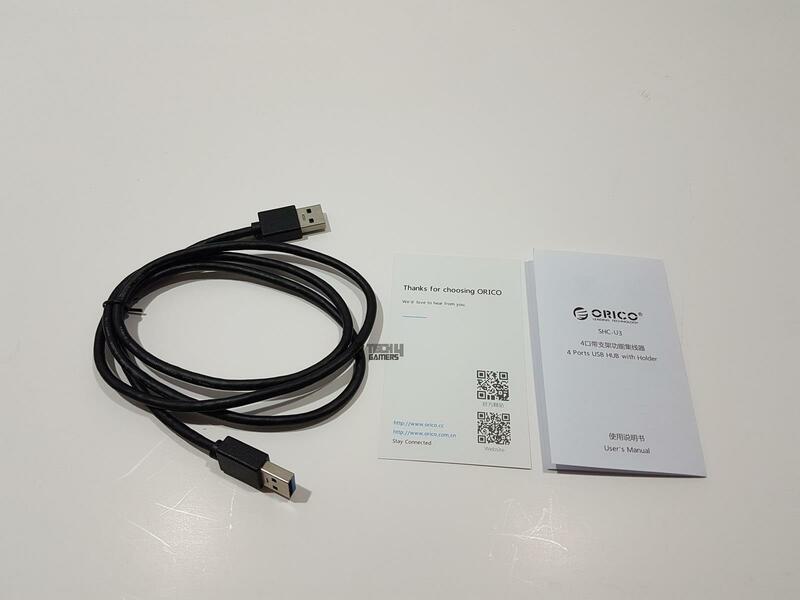 The supplied USB cable has a length of 1m and it is in black color (with the black color hub). The main hub is in a triangle shape with angular edges. The base is extended on the backside with a flipper to make a stand provision. A smart design indeed! The front side has four USB 3.0 ports in blue color. There is an LED indicator which lights up in the blue color when powered on. 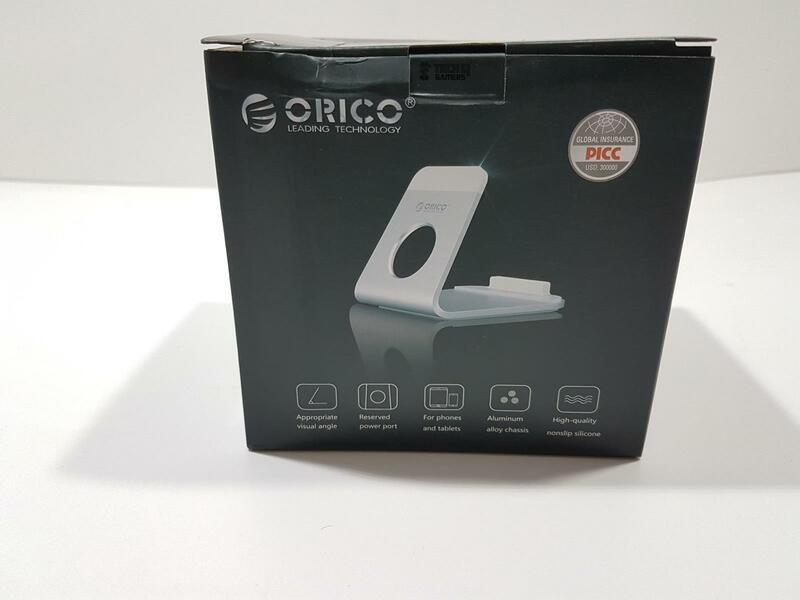 The ORICO brand name and logo are printed below the ports. The left and right sides are identical except that the right side has input USB port which connects the hub with the PC/Laptop. 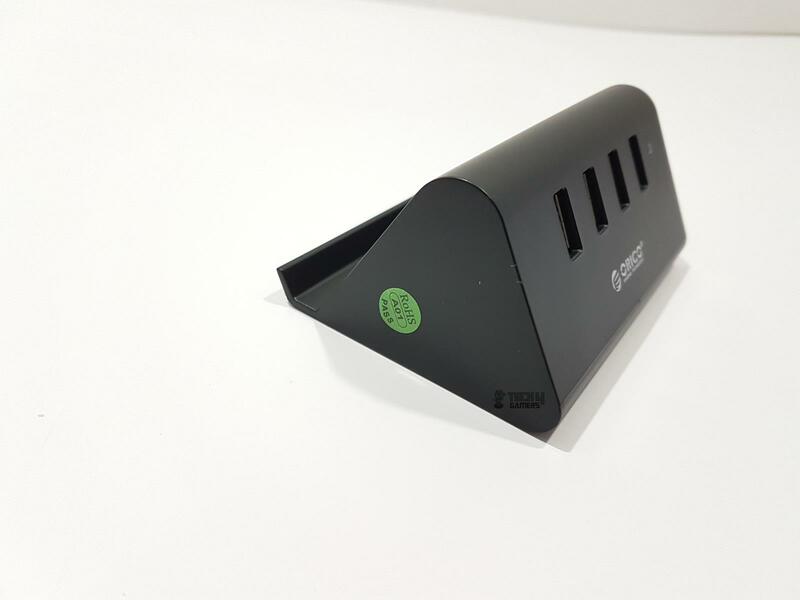 The backside of the hub has an extended base with a raised edge to form a holder for your tablet/phone. There is one caveat to it. If using that holder for a device and watching any video on the device, the USB ports will have to face opposite to the user. The base of the unit has two bit raised edges that lift the hub over the table surface. I could not get any information about the operating temperature range of this enclosure as it was heating after certain usage when 4 devices were connected to it. First, I connected the hub to the USB 3.1 port on the motherboard but it resulted in a strange behavior. 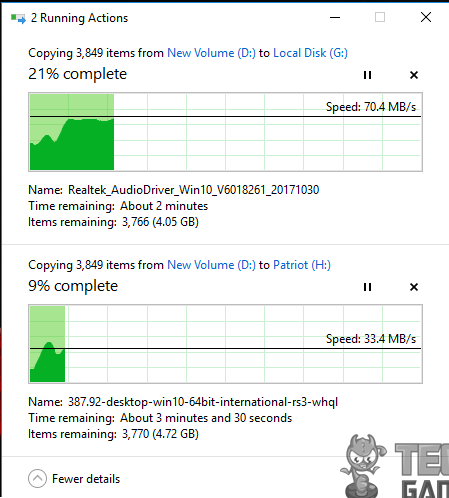 It was picking only one device at a time and not all connected drives were registered. Then, I connected the hub to the regular USB 3.0 port on the motherboard and it registered all the devices. To test the hub, I chose a folder with 5.20GB size having 3599 files and 249 folders in it. This folder was copied to the WD external drive and Viper 64GB flash drive at a same. The maximum data rate for the WD drive was 70.4MB/s and 33.4MB/s for the Viper flash drive. Not bad at all, I must say. After using the hub for data connectivity for like 30 minutes it was heating up. 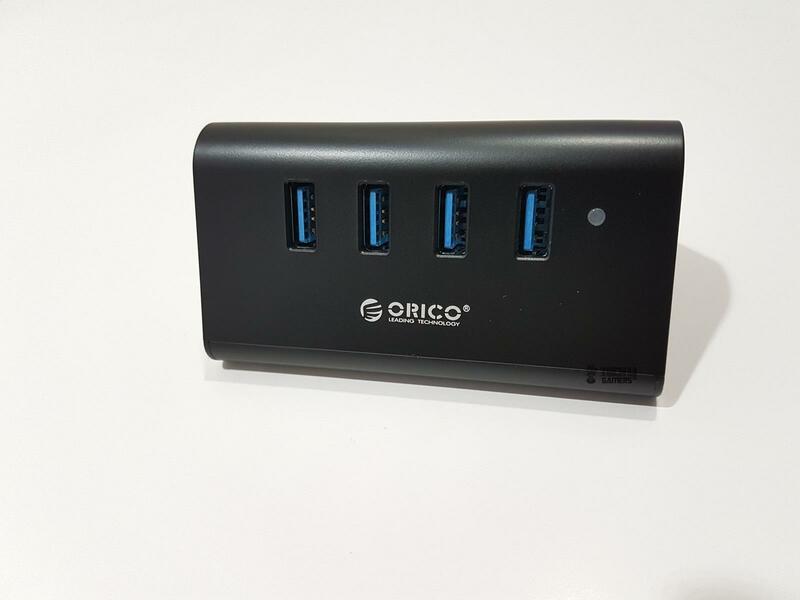 The ORICO 4-port USB 3.0 Hub and Holder is a convenient design to connect up to 4 devices using this hub to a single USB port of the PC/Laptop. It has a holder on its backside to hold your tablet/phone as well. It is like a two in one package from the ORICO. The dimension of the hub is 98x98x26mm. It has 4 USB 3.0 ports on the front. There is another port on the right side to connect the hub to the PC/Laptop. The base of the unit is extended on its backside with a raised edge to form a holder naturally coming out of the unit’s design. The basic unit is in a triangular shape with rounded edges. The hub is made of the ABS material and build quality is typical of ORICO; simply the best. This hub does not need any driver support and is compatible with Microsoft Windows XP/2000/7/8/10, Linux, and Mac OS. This hub has multiple protection features like over current protection, over voltage protection, electric leakage protection, short circuit protection, clutter protection. Unfortunately, there is no overheat protection on this unit as it got heated up after some time period of the continuous usage with 4 connected devices with one device being the smartphone connected as the storage and charging. 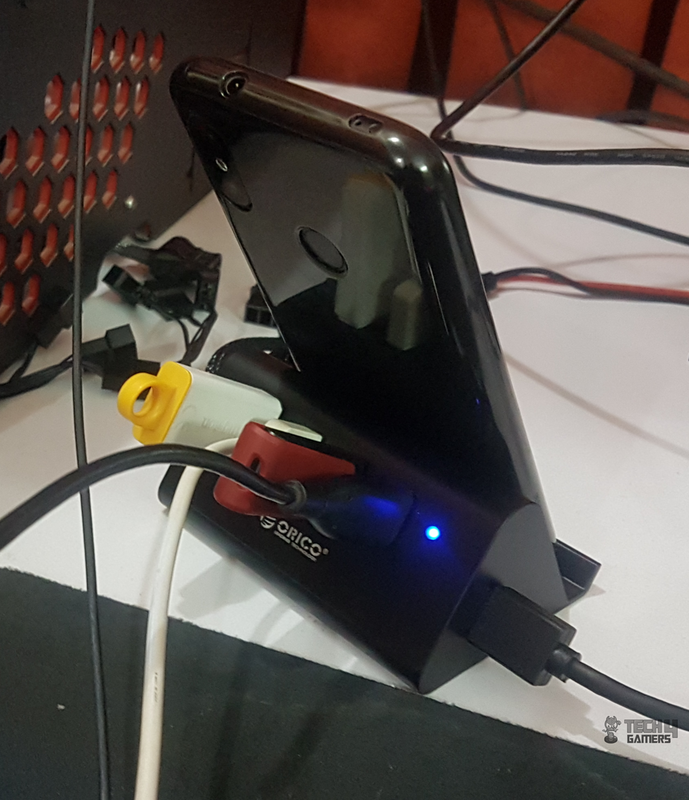 I have tested the hub using 4 devices and found it to be working as it should. 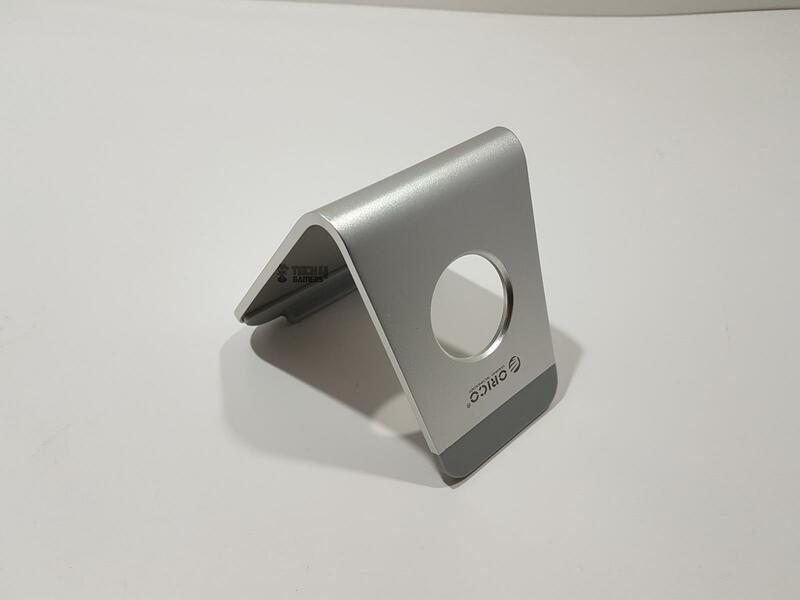 The ORICO Aluminum Alloy made stand AMS1 is CNC machined to achieve the near-perfect precision and accuracy with the top-notch finishing mimicking the Mac style. The dimension of the stand is 104x92x95mm. The weight of the stand is 0.15 KG. The backside of the stand has a large size circular hole in the middle for cable passing. The top side has gray color silicon rubber placed on the tip, creating one heck of a beautiful outlook. There is ORICO brand name and logo printed below the silicon rubber. The bottom part has an angular design. The complete block is made of a single aluminum piece and finishing has my utmost praise. The front side shows the angular design with a base of the stand having silicon rubber pasted on its tip. This silicone mat has a raised surface which is a smart move as it catches the base of the devices to fit them securely. This design also helps in reducing the slipping of the devices and ensures a firm grip. This stand is designed for the phones and the tablets to help the users with ease of use operation with 60° viewing angle. The comfortable handle is a result of the Anodic oxidation process. The stand did what it was supposed to do namely, holding the phone/tablet in a most eloquent and stylish manner. 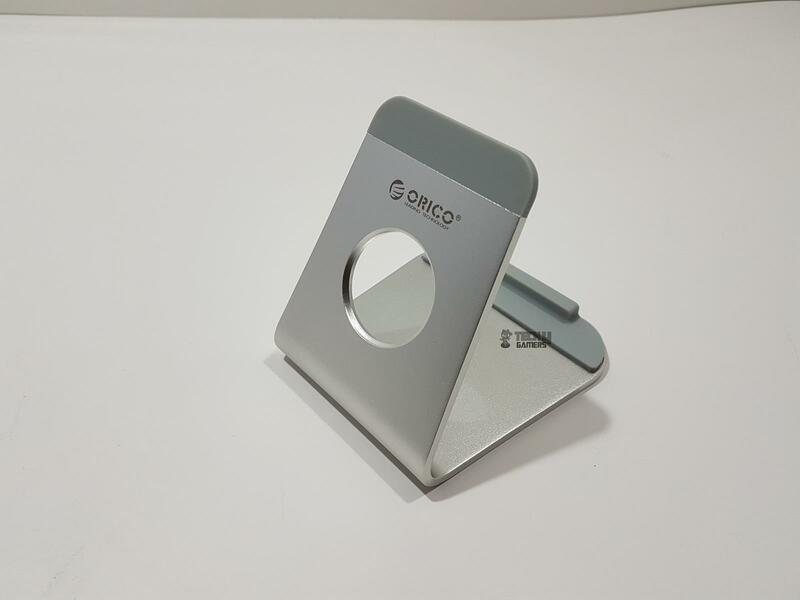 The ORICO 4-Port USB 3.0 Hub and Holder (SHC-U3) is rated at $10.99 and the ORICO Aluminum Alloy Stand (ASM1) is rated at $11.90 at the time of the review. Give the protection feature set and connectivity option backed by a provision of a tablet/phone holder on the SHC-U3 and a single body aluminum alloy stand with silicone rubbers made these two products one heck of a deal and come recommended bus.